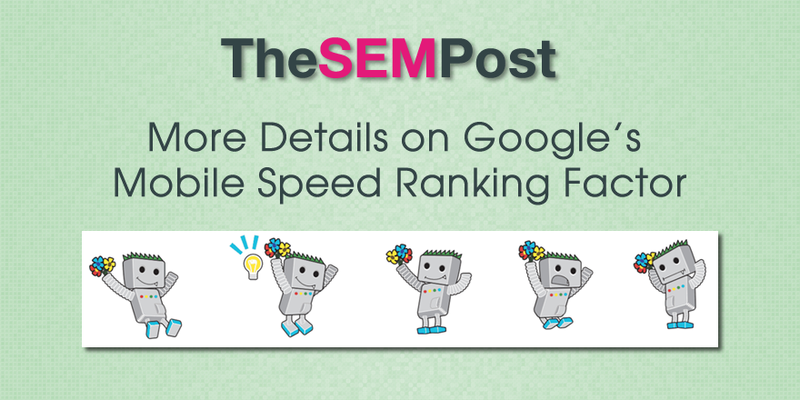 Google has officially announced that mobile page speed will be a ranking factor. The new “mobile speed update” will launch in July 2018, giving site owners roughly six months to ensure their mobile sites will not be negatively impacted. It had been confirmed that mobile page speed would be included as a ranking factor, but this is the first time we have the confirmation of when it will start being used by Google. Here is what SEOs need to know about the upcoming changes. We will also continue to update with new information. 3 AMP Pages Automatically Pass? 10 What Metric is Google Using for Speed? Google is calling this a “Speed Update”, so this isn’t a latest and greatest mobilegeddon. This is pretty straight forward – if your mobile site is fast, you don’t have much to worry about but if it is slow, you have a real reason to be concerned. If you use AMP for your entire site, you don’t have too much to worry about, unless for some reason your AMP pages are loading slowly. Google doesn’t care what technology sites use to get fast pages, whether a regular mobile site or AMP, so long as it is speedy. "It applies the same standard to all pages, regardless of the technology used to build the page." — you can use any technology you like; no assumed advantages. If you use a mix of AMP and mobile – such as using AMP for your site’s info pages but regular mobile pages for product pages – then Google will determine speed based on the page they show in the search results. Again, AMP pages should pass this with flying colors, unless there is an issue where your AMP pages are slow. But you can also use various pagespeed tools on any AMP pages if you want to double check. The blog posts also states “It applies the same standard to all pages, regardless of the technology used to build the page.” So again, AMP doesn’t automatically get a pass. If you are struggling with a slow mobile site, and haven’t solved the speed issues when it is closer to the July launch date, then enabling AMP might be a solution if you are concerned about being demoted with the page speed update. If your site is already fast, you won’t gain any Google benefit from raising your fast score even higher. That said, it is still great to do that for user experience to deliver the fastest pages possible to visitors. But this specifically impacts only the slowest sites. However, Google won’t specify exactly how slow that is. If you think a site is slow to load when visiting it, chances are Google thinks it is slow too. So if someone is searching for “Site ABC”, even if the site is horrendously slow, Google will still show the “Site ABC” in the search results and most likely still in the top position (outside of other ranking factors, of course), because the user intent is clear the searcher wants that specific site. But for search queries where the user intent isn’t your site? If your site is very slow, you will be demoted in the search results. Even though this is launching in July 2018, it is independent of Google’s mobile first indexing. So Google does not plan to tie the changeover to a completely mobile first indexing to this July launch date for mobile page speed. It is important to note that Google is still planning to use desktop speed for desktop searches, at least for now. While this will very likely be changing when mobile first indexing is fully launched (unless the site is only desktop), for now Google is still using desktop speed for desktop. This also means you can’t ignore desktop speed for Google purposes. John Mueller also confirmed it as well. What Metric is Google Using for Speed? Google hasn’t confirmed which speed tool they are using for determining speed. Instead, their blog post refers to PageSpeed Insights, which has just been updated, Lighthouse, and the Chrome User Experience Report, which is now added into the PageSpeed Insights tool for some sites. If your site is slow and being negatively impacted by this mobile speed update, you will not be alerted to it. According to a Google spokesperson, Google will not be sending out any notices via Google Search Console if a site is considered too slow. Google also said there is no tool that can be used for a site owner to tell if they are impacted either, outside of seeing slow scores in the three tools Google references. Google also said the mobile speed is completely algorithmic. That means even important sites won’t get a “pass” per se. But as they said user intent is important, page speed is only a small part of the ranking factors. For those wondering whether mobile speed will impact Google showing AMP only in their mobile carousels, such as extremely fast non-AMP mobile pages being included, the answer is no. Google is still reserving those carousels for AMP pages. This update has no relation to the carousel.